Acting Morris County Prosecutor Fredric M. Knapp, Acting Union County Prosecutor Grace Park, Parsippany Troy-Hills Police Chief Paul Philipps, Federal Bureau of Investigations Special Agent in Charge Aaron T. Ford, Springfield Police Chief John Cook and Newark Police Department Director Samuel A. DeMaio announce the arrests of Avery Spotswood, 43 years old of Newark, New Jersey and Quiama S. Harris, 29 years old, of Newark, New Jersey, on a variety of charges including Robbery, Conspiracy to Commit Robbery and Terroristic Threats. At approximately 1:36 p.m. on December 23, 2013, a black male, described as being “tall”, weighing approximately 180 lbs entered the Santander Bank at 239 Littleton Road in Parsippany, New Jersey. The suspect approached the teller and allegedly handed her a handwritten note which read, “Don’t Move! I have a Bomb. Nobody is safe until I am. No dye packs no tracers. 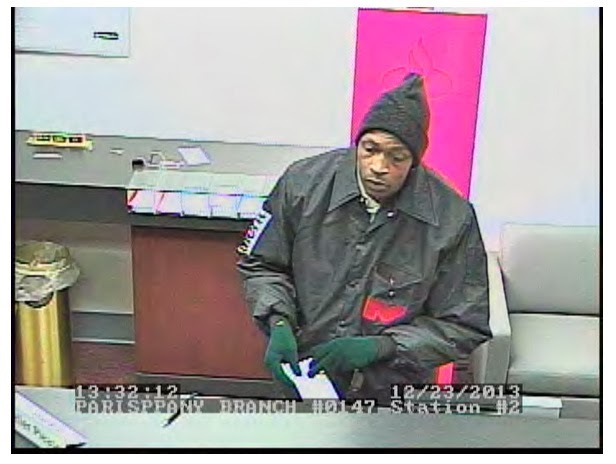 Put all cash in this bag.” The teller placed money into the suspect’s bag and he fled the bank on foot. Members of the Parsippany Troy-Hills Police Department and the Morris County Prosecutor’s Office obtained still photos from the bank which depicted the actor in the course of committing the robbery. Parsippany-Troy Hills Detective Joseph Puso put out a “Critical Reach Notification” to all law enforcement agencies in New Jersey describing the robbery, including the contents of the note and still images of the male suspect. In response thereto, police learned of a similar incident which recently occurred in Springfield, New Jersey. Detective James Mirabile of the Springfield Police Department informed Detective Puso that he had developed information from a license plate of a motor vehicle which was in the area of a Springfield bank robbery, which may have been related to the incident in Parsippany. The registrant to this vehicle was identified as defendant Quiama S. Harris. Detective Puso and Detective Supervisor Matthew Potter of the Morris County Prosecutor’s Office, Major Crimes Unit obtained information that a black female had entered the Santanderbank in Parsippany prior to the robbery. The female had asked various banking questions, but she did not make a deposit or conduct any other business. Still images from the Santander Bank captured this female. As a result of information provided to detectives by the Springfield Police and other law enforcement agencies, police were able to identify Quiama S. Harris as the female who entered the Santander Bank. 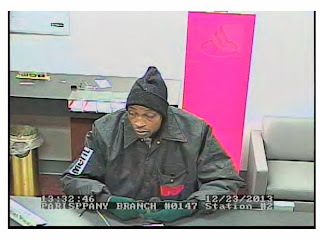 Subsequent police investigation identified Avery Spotswood as the individual captured on the surveillance photographs in the Santander Bank robbery. 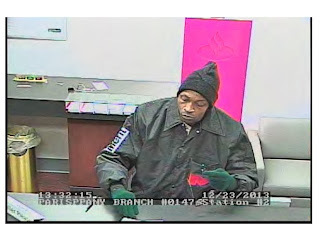 Police learned that the defendants were working collaboratively to commit the Parsippany bank robbery. Spotswood and Harris were arrested by members of the Morris County Prosecutor’s Office, the FBI Newark Division, the Parsippany Troy-Hills Police Department and the Springfield Police Department. Defendant Spotswood was charged with Robbery, N.J.S.A. 2C:15-1a (2), a crime of the first degree; Conspiracy to Commit Robbery, N.J.S.A. 2C:5-2/15-1a (2), a crime of the second degree; and Terroristic Threats N.J.S.A. 2C:12-3, a crime of the third degree. Defendant Harris was charged with Conspiracy to Commit Robbery, N.J.S.A. 2C:5-2/ 2C:15-1, a crime of the second degree. The Honorable Mary Gibbons Whipple, J.S.C. set bail for defendant Spotswood at $200,000 with no ten percent option. Spotswood is to have a bail source hearing and must surrender his passport. Judge Whipple set bail for defendant Harris at $100,000 with no 10% option, cash only. She must also have a bail source hearing and surrender her passport Both defendants were unable to post bail and were remanded to the Morris County Correctional Facility. Anyone with information relating to these charges is urged to contact the Parsippany Troy Hills Police Department at (973)-263-4300 or the Morris County Prosecutor’s Office Major Crimes Unit at 973-285- 6200. Acting Prosecutor Fredric Knapp would like to thank the Union County Prosecutor’s Office, Morris County Sheriff’s Office, the Parsippany Troy-Hills Police Department, the Springfield Police Department, the F.B.I. Newark Division, the Newark Police Department and the members of the Morris County Prosecutor’s Office Major Crimes Unit whose efforts contributed to these arrests. 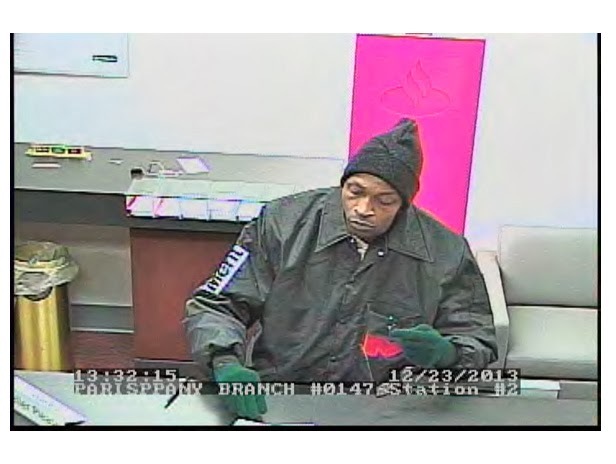 On Monday, December 23, 2013, at approximately 1:48 p.m., a robbery occurred at the Santander Bank located at 239 Littleton Rd., Parsippany, New Jersey. The suspect fled from the scene. Multiple law enforcement agencies responded to this location, including the Major Crimes Unit of the Morris County Prosecutor’s Office, the Parsippany-Troy Hills Police Department, the Morris County Sheriff’s Office, and the Federal Bureau of Investigation. These law enforcement agencies are seeking a black male who is depicted in the security video image attached below. Any person with information regarding this incident is requested to contact Sgt. Steven Brylinski of the Morris County Prosecutor’s Office at 973-285-5336, Det. Joseph Puzo of the Parsippany-Troy Hills Police Department at 973-263-4300, or Morris County CrimeStoppers at 973-267-2255. Any press inquiries can be directed to First Assistant Prosecutor/SDAG Thomas Zelante at 973-285-6252 or [email protected]. Acting Morris County Prosecutor Fredric M. Knapp announces that in June 2013, the Morris County Prosecutor’s Office Fugitive Unit was provided with additional staffing and resources to place an emphasis on decreasing the amount of active fugitives wanted in Morris County. Since the commencement of the initiative in June of this year, the Morris County Prosecutor’s Office Fugitive Unit has dramatically reduced the number of active warrants. The results are listed below. Acting Prosecutor Knapp thanks the members of the Fugitive Unit for the work they have performed in an effort to reduce the warrant backlog, especially Captain Daniel DeGroot and Sergeant Carmen Ferrante, under whose leadership these excellent results have been achieved. Anyone who knows they have an active arrest warrant in Morris County are encouraged to call the Morris County Prosecutor’s Office Fugitive Unit and arrange to turn themselves in.